A U.S. judge on Tuesday awarded $21 million to seven people who sued a former prime minister of Somalia now living in Virginia, claiming he tortured and killed his own people more than two decades ago. The judgment against Mohamed Ali Samantar, 76, of Fairfax comes at the end of an eight-year legal battle that went to the U.S. Supreme Court. Seven Somali natives filed the lawsuit in 2004 in federal court in Alexandria against Samantar, who served as vice president, defense minister and prime minister throughout the 1980s under dictator Siad Barre, until the months before the regime collapsed in 1991. The suit claimed Samantar personally ordered the killings and torture of members of the minority Isaaq clan. Samantar denied the accusations and claimed immunity from the lawsuit. On the day the trial was to begin, he entered a default judgment. While he accepted legal liability for the killings, he denied wrongdoing. One of the plaintiffs, Aziz Deria of Bellevue, Wash., said that the ruling vindicates efforts to hold Samantar accountable. "The case was never about money," said Deria, who has little expectation of recovering his $3 million share of the judgment against Samantar, who is bankrupt. "This case was about having an opportunity to be in court with Samantar and prove he was in charge of what was happening." Samantar's lawyer, Joseph Peter Drennan, said he will appeal the ruling. In fact, the case is already on appeal. The 4th U.S. Circuit Court of Appeals is considering whether Samantar was properly denied immunity. The case, first filed in 2004, has had a tortuous path through the courts. At first, U.S. District Judge Leonie Brinkema dismissed the case, ruling that Samantar enjoyed legal immunity as a former foreign official. But the U.S. Supreme Court rejected that argument. Eventually, the State Department argued in a legal filing that Samantar could not claim immunity because Somalia had no central government that could claim immunity on his behalf. Brinkema then allowed the case to go to trial. Samantar's lawyer objected, saying the judge was granting excessive deference to the State Department — Brinkema had said she would have dismissed the case if the agency determined it could harm international relations. After Samantar defaulted at the outset of the trial in February, the trial proceeded without him. During the shortened trial, the plaintiffs presented evidence including a 1989 BBC interview in which Samantar acknowledged a leadership role in the bombing of Hargeisa, a city in the northern part of the country. Hargeisa was home to a large Isaaq population and a stronghold of a regional movement to break off from Somalia. The evidence also included testimony from an army colonel who said he overheard a series of radio communications in which Barre was urging moderation in a bombing campaign, while Samantar advocated a harsher attack. 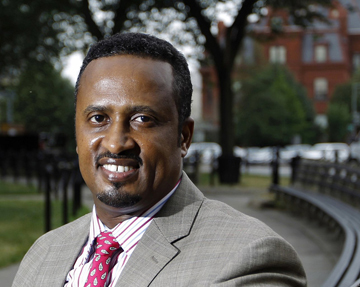 Several plaintiffs — some who live in the U.S. like Deria and others who still live in Somalia — told chilling stories of narrowly escaping summary execution, suffering beatings and spending years in solitary confinement in jail. Deria sued on behalf of his brother and father, who were killed. The San Francisco-based Center for Justice and Accountability, which represented the plaintiffs, said Brinkema's ruling is the first anywhere in the world to hold a leader in the Barre regime responsible for the crimes it perpetrated. "This is a remarkable result for our clients, who faced down one of the most powerful men in their country's history and forced him to concede liability for his crimes," said Steven Schulman, one of the plaintiffs' lawyers. But Drennan said Samantar continues to deny wrongdoing, and believes that efforts to hash out these claims in a U.S. court are counterproductive to the efforts to promote reconciliation and a cohesive national government in Somalia. The lawsuit "needs to be seen for what it is — politics and clan warfare in the courtroom," Drennan said. Deria, on the other hand, said holding Samantar formally accountable for atrocities in Somalia's civil war is the best way for Somalia to move forward. He said that clan retribution can be set aside when people can be assured of justice through the legal system and that he hopes the case can highlight to the Somali people that justice is attainable. "This is the civilized way of dealing with criminals," he said.